In my earlier post (What is the fastest way to return the Record Count from an Access table? ), I found the fastest way to return the record count of an Access table. It turns out the RecordCount property of the OpenRecordset method is at least ten times faster than any other method. Unfortunately, the RecordCount property does not work the in the same way for a query as it does for a table. For a query, it will return a record count of 1, regardless of the number of records in the query. The reason for this has to do with the three recordset types that OpenRecordset returns. The RecordCount property returns the number of records in the table. When the object I'm opening is a table, it defaults to dbOpenTable, so I don't really need to specify it. What makes this so fast is that the record count is actually stored with the table. It doesn't need to calculate the record count at all. the recordset property returns only the number of records accessed, which is 1 when the recordset is first opened. In order to find the actual number of records, I have to use the MoveLast method to move to the last record. Then the RecordCount will return the accurate number. This should be much slower, since the MoveLast method is not particularly fast. But is this true? I propose to find out. 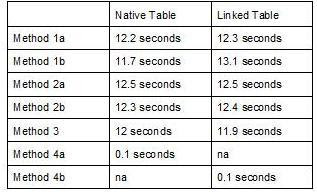 I tested both native and linked tables, so I had two databases on a standard 100mbps network. Recordcount property of the OpenRecordset method. Each of these methods has several variations, but as I showed in the last post, the difference isn't enough to worry about. So this time, I only tested one variation. I used a query which returned 7125822 records from indexed native and linked tables across a standard 100mbps network. To minimize any differences in network traffic and processor usage, I ran each of the methods 10 times and averaged the elapsed times. The Figure 1 below shows the outcome. To be honest, I expected that the RecordCount method would be significantly slower than the other methods. I assumed that while DCount and SQL would make use of the index while the MoveLast method would have to do a full table scan. That should be slower, but that doesn't appear to be the case. As far as I can determine, there isn't any significant difference between the various methods. I hate being wrong. This sample illustrates how to write values from a multiple valued field (not the Access 2007 multi-value field) into a normalized Many-to-Many structure. The original table is called "ContactsDownloadMultivalue". The contact information is written into "tblContacts". The category information from the multiple valued field is written to "tblCategories". Then a record is created in jtblContactCategory junction table, establishing the many-to-many relationship. In order for any program code to be run by a computer, it must be converted to machine-readable code. This code is called Object Code. The text version of this program that you and I can read is called Source Code. In Access, the process of producing Object Code from Source Code is called "compilation". Whenever code is run for the first time in Access, the code is first compiled. (You can also compile it yourself by pushing the compile button). The only place you can make changes to code is in the Source Code, which must again be compiled into Object Code. Occasionally, code can be deleted from the Source Code, but for some reason is never removed from the Object Code. This code is never again seen on the screen as text, but is still sitting there somewhere in the database file. This can, at times, interfere with the normal operation of the program. To remove these stray bits of code, you can "Decompile" your database and then re-compile it. This process removes all of the compiled Object Code, then when you re-compile it, you only get Object Code that reflects the current Source Code. where the first part (in quotes) is the complete path to your Access program. If you have the default installation, it is likely that it is just as listed here. Click OK. Note: if you have Windows Vista, just type the command line in the Start Search box of the Start menu. This will open Access and allow you to choose which database to open. Whichever database you open will be decompiled. Choose a database and open it. Access 97 used to give you a dialog which told you the database had been decompiled, but newer versions do not. Nevertheless, the database has been decompiled. Open any Module in design view, or any Form or Report in design view and choose View > Code from the menu. In the next screen, choose Debug > Compile from the menu bar. Note: In Access 2007, you can also choose Database Tools on the ribbon, then select Visual Basic. Then choose Debug > Compile. Your database has now been Decompiled and Re-compiled. I use decompile quite frequently, so instead of typing the command line into the Run box, I've created a shortcut on my desktop. 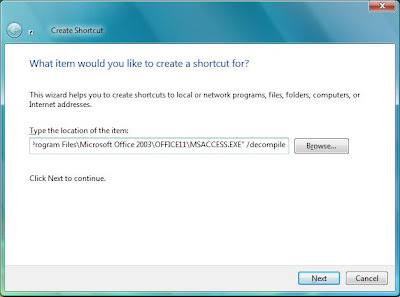 There are several ways to create a shortcut, the easiest is to use the Shortcut Wizard. It will ask to name your shortcut. 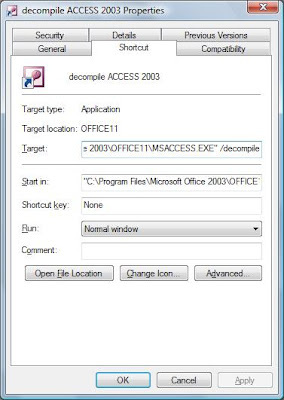 Choose something descriptive like Decompile Access 2003. And click Finish. Now when I want to decompile a database, I just click the shortcut and start with Step 3 above.